"The hen" perches in her watery roost just off shore South of Hienghene, New Caledonia. The lookouts on both sides of the town of Hienghene offer exceptional panoramic views, especially of the iconic Hen.. In search of wifi, I wandered down to the Koulnoue Village, the resort hotel "next door" to our campsite at Babou Cote Ocean in Hienghene. Whist struggling with the wifi, I noticed a solo diner with his laptop open to what looked like email, and asked him if he was on. He was, he said, admitting the wifi was flaky, not working at the moment, but was better where he sat. So I joined him, with his welcome. Closer zoom in on Hienghene's hen massive rock formation. 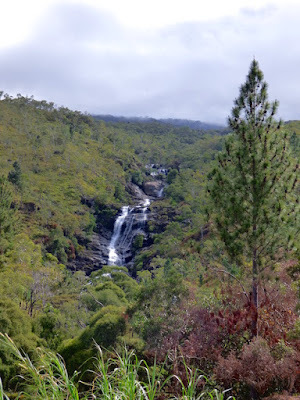 Northern Provence, New Caledonia. Briochette, my favorite New Cal road food. His name was Eric, and he was traveling from France. "I've traveled all sorts of violet places, through warring African nations" he attested, "and never felt less welcome then here on the North Coast, where the Kanaks are. My friends tell me the Kanaks set fires all over, and throw dead animals in swimming areas to lure in the sharks." I loved the wombly legs of this honesty stand. There were many similar stands along New Caledonia's Northern coast. Frankly, I was shocked. Not by what some Kanaks may (or may not) have done, but by what Eric and his friends believed about their culture as a whole. And, how wrong it was from our perspective and personal experience. It reminded me of when a French dentist in Nuku Hiva told me the locals in neighboring island Hiva Oa were unfriendly to whites, threw rocks at them, and were stupid. I disagree vehemently, attempting to give examples to the contrary (like this one) though he was clearly not willing interested in a different perspective, though he's spent almost not time there and not experienced his bias firsthand when there. 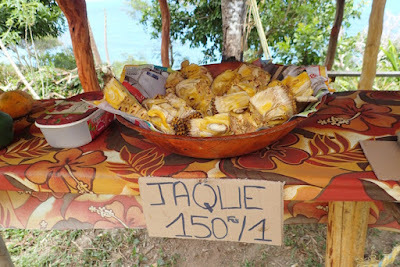 We're not quite sure what jaque was, but it was a bit pinapple-y in flavor. Everywhere we went the Kanaks of the North were friendly. Two days before the folks in the local market took quite a bit of time with me helping me sort out where to camp, with one fellow even stopping what he was doing to get in his vehicle and go several miles out of his way to lead us there. Every smile, if not initiated by a Kanak, was returned, as was every wave when we passed by. Given the dispossession of land, history of disrespect, battles where the end result was nearly always far bloodier for the Kanaks than the well-armed French, not to mention the 1989 assassination of Kanak's Martin Luther King-esque pro independence hero, Jean-Marie Tjibaou (who was killed by a Kanak activist who didn't believe the French would honor the peace accord Tjibaou signed). When we got to the town of Hienghene, we drove into the parking lot of the cultural center. We were greeted by a profusely apologetic Kanak, who was visibly sorry we couldn't see Hienghene's cultural center, as it was closed indefinitely. The artifacts, we were told, were for the most the part sent to "Noumea, the Paris of New Caledonia," for the museums there. Indeed we saw these treasures at the National Museum of New Caledonia and at the Tjibaou Cultural Center, and can understand how a native could feel robbed of their cultural icons. 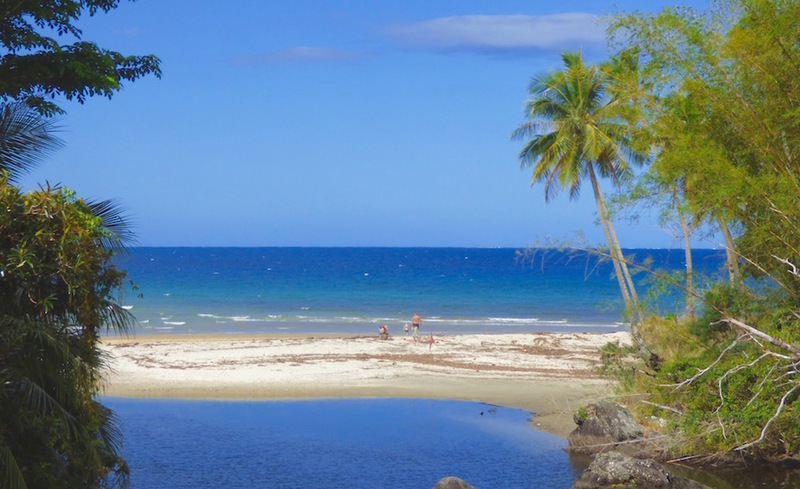 Shoreline, North of Hienghene, New Caledonia's Northerm Province, East Coast. Honestly, I felt a little regretful we'd opted out of spending time at a Kanak Village. Unlike the central markets in the other South Pacific countries we visited, there was very little of the Kanak culture present in Noumea's central market. I'd hoped to try a bougna, a Kanak culinary specialty. 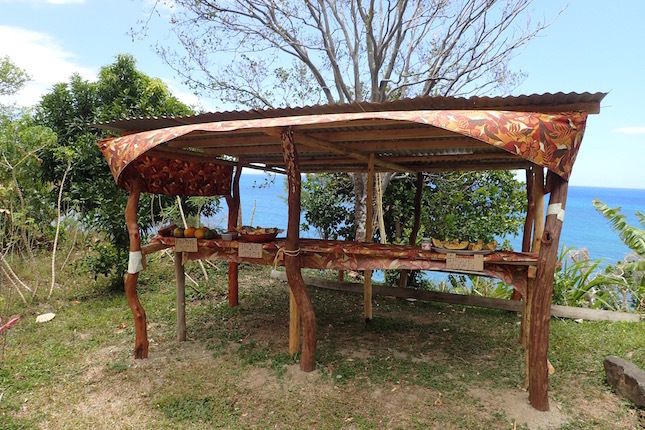 Similar earth-baked cuisine was far more readily available on other South Pacific islands, at markets and festivals. The Kanak festival we attended only (large!) family-sized bougna was available, whereas elsewhere a taste was an option. My gluttony aside, I regret not getting to experience a more personal connection with at least a few Kanaks. its captain is ready when we are, fording us across the river. Free. Ironically, what rudeness we did experience in New Caledonia -- not much -- overall we found our interactions quite positive -- came from French or European New Caledonians (sometimes referred to as Caldoche). Mostly, we had issues specific to giving sufficient boat space. Tao Falls, halfway up the trail to its base. New Cal. When we complained to cruising friends Robyn and Mark of Mintaka of how we felt like a bulls'-eye was painted on our boat, given the close calls from other boats despite our right-of-way. We joked about how our friend cruising Lili of Heron commented on the anchoring habits of French boats, satirizing in a French accent, "Zee French boats, zay like to snuggle." Robyn and Mark shared a story about one of her friends who complained to the offender when it happened to her. "Perhaps," he flirted, "We could kiss!" "Perhaps," she saucily retorted, "You could kiss this!" pointing emphatically to her derriere. He moved. "Laissez-faire is French word," Mark observed. Robyn added, only partly joking, "It's not that the French don't believe in rules. They just don't believe that the rules apply to them!" 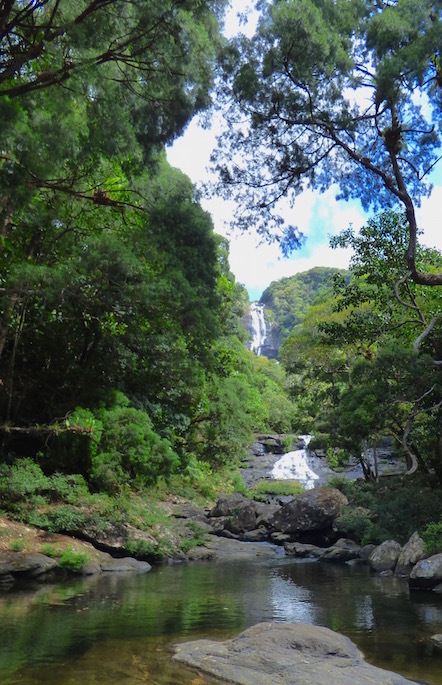 Tao waterfall, at base. New Caledonia's Northern Provence. 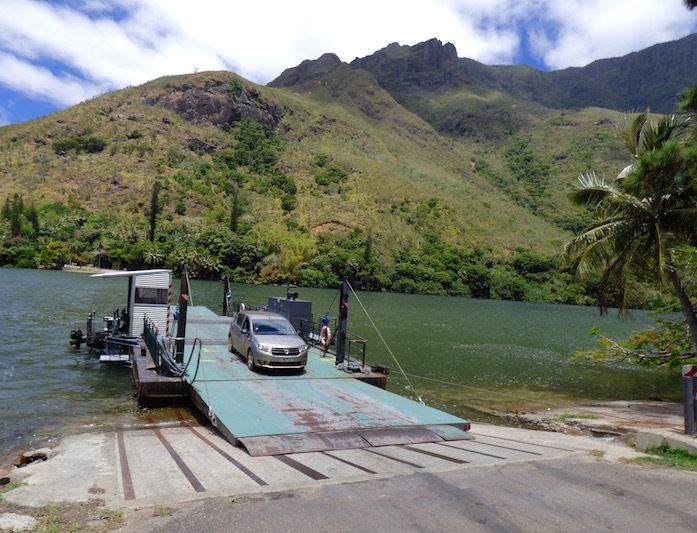 While we did experience periodic aggressive tailgating, overall driving was a safe and pleasant experience in New Caledonia. 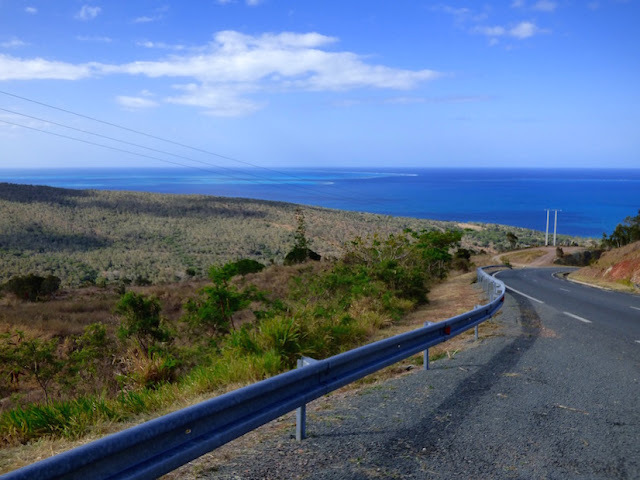 We did notice the further we got from Northern territory and the closer to Noumea, the less friendly and more aggressive drivers, particularly tailgating, became. Back on the Road -- Fantastic Scenery! 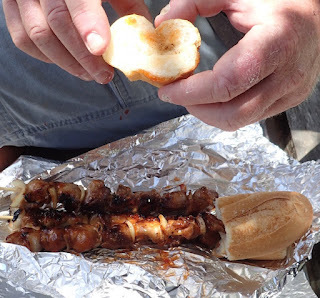 We stop off in Hienghene's central market for delicious briochettes, generally marinated chicken and onion kebabs, BBQ'd, foil-wrapped and served with two small pieces of baguette. $2-3 is typical per kebab. Then away we go.... The Northern Coast is simply spectacular. Most of the road hugs the sea, its shallow, coral-flanked shores glimmering bright blue-green jewel tones in the sunlight. 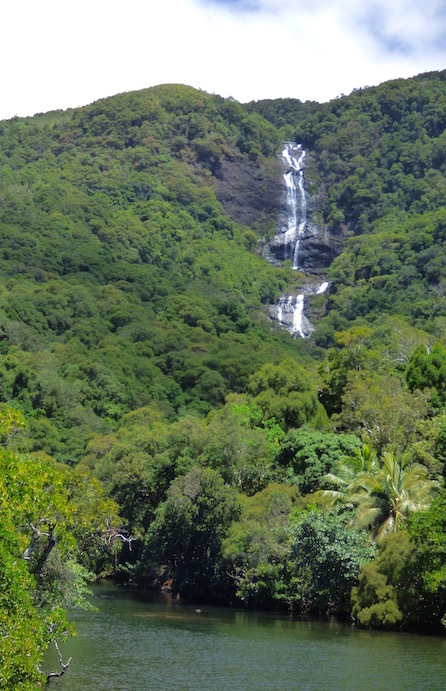 On the other side, mountains reach steeply for the sky, cloaked in a verdant green tapestry of New Caledonia's unique endemic flora. Waterfalls and rivers periodically connect the two - the drive is an ode to water. 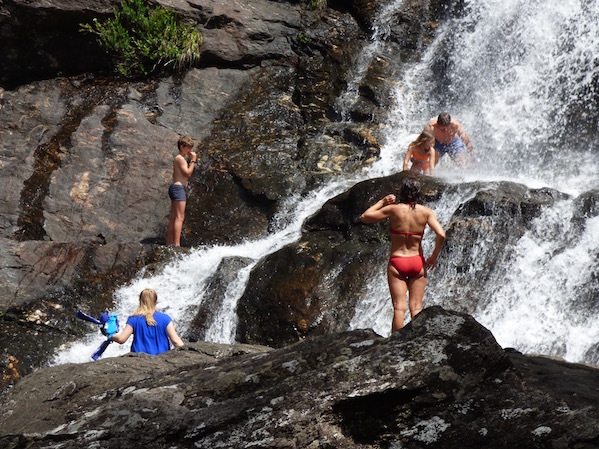 Tao waterfall, a great place to play on a sunny day. Northern Province, East Coast, New Caledonia. We took a few hours out to hike to the base of Tao waterfall. The trail was excellent, and free. We dipped our toes, and kicked back. The people watching was excellent, from happy families, to show-off teens to even the proverbial older French guy sporting a speedo. The trail was so nicely maintained, we made a thank you donation as we left. Another Northern Provence waterfall, North of Tao. Admittedly, perhaps our trail donation was as much due to guilt over being a little short on change for an honor box earlier back. It was unmanned nor was there the ability to make change ourselves. It was a tough call... to take nothing, leave not quite enough money or way too much. We hope the owner is ok with not quite enough monetary gratitude -- it appeared by that afternoon we were the only customer. Learn from our mistake - bring plenty of change for the honor box after the bridge! Eventually we reached the last major island crossing, and climb the last of New Caledonia's peaks, into the dry lands. From there, our trip is mostly uneventful. We spent the night at Koumac in a hotel with a kitchenette, Montel Koumac, ~$120/night, as too many nights on flat air mattresses enabled a bad cold to set in. I was in need of an infusion of chicken soup a camp stove devoid of butane was unable to deliver. From Koumac, we bombed back to Noumea. A rest stop along the way gave us a quick peek at how seriously petanque was taken here. It appeared the whole town turned out! There were big trophies and, inexplicably, a whole slew of the small green pumpkins grown here. Halloween, perhaps? Looking seaward, inlet from that same waterfall. Pay the extra for unlimited miles. 150 km/day is typical for limited and we averaged 180 km/day. That includes one day of no driving (before we returned our rental car)! Bring several good maps and study them and the road closely, though if you make a wrong turn, enjoy the ride! Who knows what you'll find? Expect long distances between places to sleep, refuel and purchase food, nor can you count on them being open when you expect. Plan accordingly, and travel as self-sufficiently as possible. If you're camping, make sure your camping gear is more up to snuff than our air mattresses and camp stove! If you like a comfy outdoor seat, bring your own. We got lucky and were relatively bug-free, but always bring bug spray, sunscreen and lots of drinking water. If there's only one bungalow, don't count on it being available. The further you get from Noumea, the less likely English will be spoken, particularly on the East Coast. Bring lots of change for honor boxes. A "cheap" hotel will still likely cost over $100 USD. 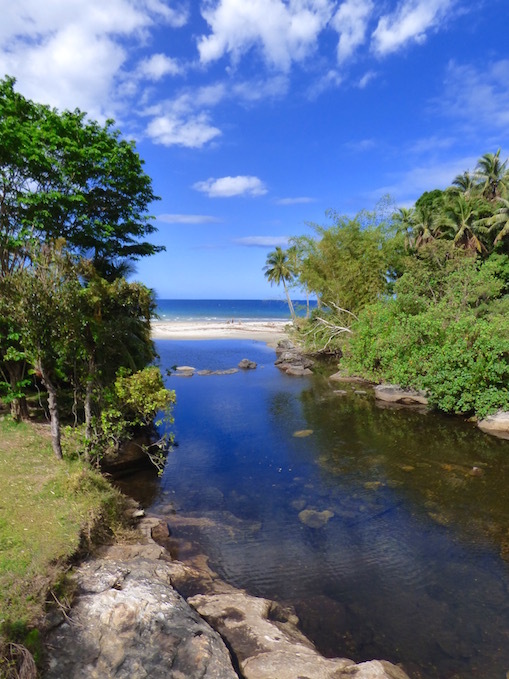 Camping and tribal gites are the least expensive options. I did not price farmstays or B&Bs. 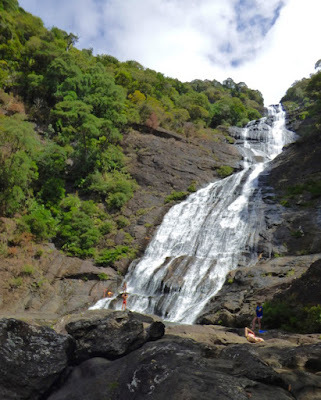 If you're into waterfalls and lush scenery, minimize your time on the area North of La Foa on Grande Terre's West Coast. We wish we'd taken a different crossing than Ouegoa to Koumac, and also saw the East Coast between Yate and Kouaoua. Another day or two, and taking in the Northern tip at remote and wild Poum and spending more time on the East Coast Coast would've been great. Lots of waterfalls and amazing coastline. For serious hikers, there are some excellent multi-day backpack trails. Take the visitor center's camping recommendations with a grain of salt -- they probably haven't camped there themselves. Ideally allow enough time that if you're not too pleased with your planned choice, you have alternatives before darkness sets in. Beach past waterfall inlet. 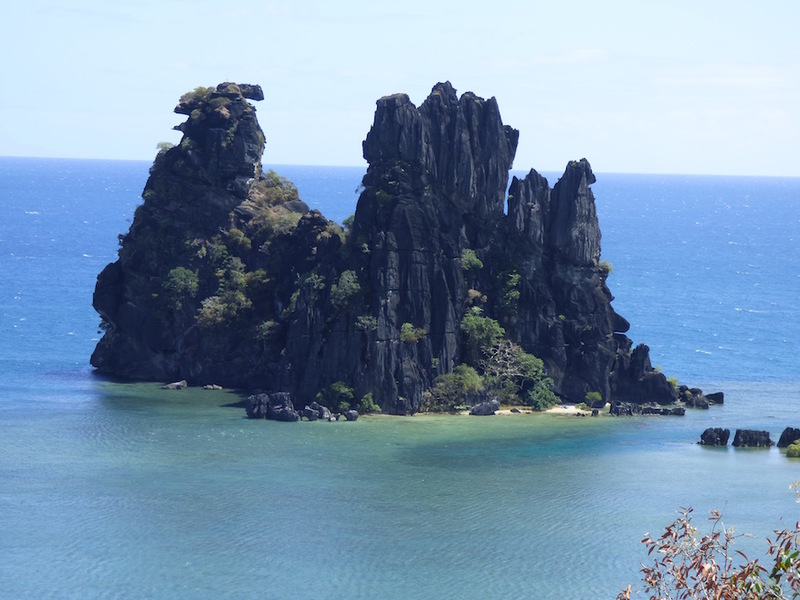 Northern Province, East Coast, New Caledonia. RT Day 1: Noumea through Grand Sud and back, departed at 11:30 am, returned to marina ~5:00 pm, 250 km (155 miles). RT Day 2: Noumea to Farino, departed at 1:45 pm, arrived at campsite ~ 4 pm, 138 km (85 miles). RT Day 3: Farino to Canala, departed campsite at 9:45, several stops / hikes, arrived at campground ~ 5pm, 91 km (56 miles). The previous post includes some stops -- Giant Fern Park, and Saramea's Trou Feulliet waterfall and Sarramea in those 91 km. RT Day 4: Canala to Hienghene, lots of stops but nothing much off route (note -- this post was written and prescheduled then mysteriously disappeared. will re-write and re-post after arrival in Australia -- wifi's too sketchy for that now) , 7:30 am - ~3:40 pm 261 km (162 miles). RT Day 5: Hienghene to Koumac, lots of stops but nothing much off route, departed ~10:15 am, arrived in Koumac ~5 pm 148 km (92 miles). RT Day 6: Koumac to Noumea, for the most part, straight back, just a few brief stops, left at 10:30 am, arrived in Noumea mid-afternoon, 375 km (233 miles). 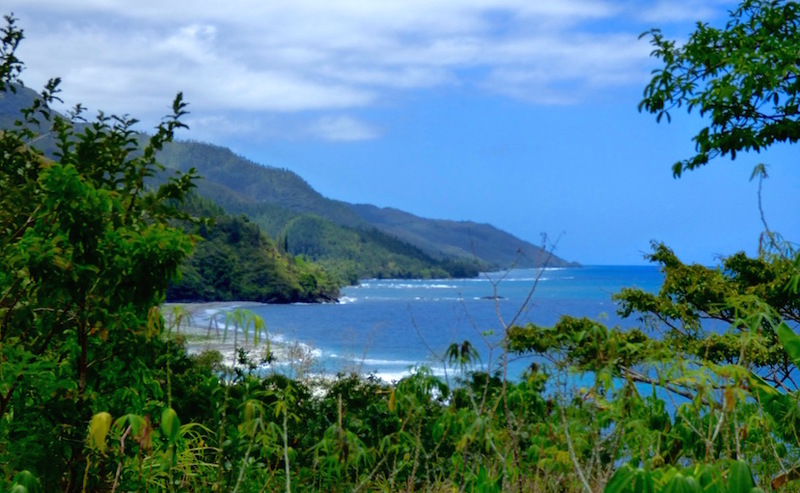 Looking back at the East Coast, we begin the climb over the last of New Caledonia's mountains to Koumac on the West Coast. Green is good. 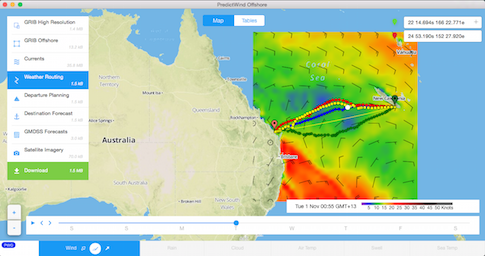 By the time you read this, we're hoping to be surrounded by serene green, winds of about 15 knots, Bundaberg bound. By the time you read this, we'll be underway to Australia, about a 1 1/2- 2-week ~760 mile passage. We'll be out of wifi range until we're set-up for wifi again in Australia. If I have time or get lucky on wifi on our way out at Amedee Lighthouse, there will be some pre-posted catch up posts on New Cal while we're underway. Once in Oz, we'll check in at Bundaberg, then travel South down the East Coast to Pittwater, near Sydney where we'll park Journey. We'll travel over land there for a bit and figure out where to go back to work somewhere in the world. Job tips are appreciated!